We live in a world of capitalism and construction, of wheeling and dealing. But, have you ever wanted to just dive back into your childhood and relive some of those simple joys… without worrying about breaking any copyright laws? Perhaps you’ve considered reconnecting with a simpler, more natural lifestyle, where everyone has a comfortable role in their society and manage to live in tandem with their environment… but, still, without worrying about those copyright laws. Maybe you enjoy singing with your community and enjoy a fantastic melody but have a poor memory for lyrics? Here’s one for you:La, la, la, laa, la, laa. Well, things have changed a lot since you were a little tyke. Mostly the growing part. You’re a lot taller than you used to be, so if it was tough to hide from prowling antagonists then… maybe some odd wizards or their nasty cats… it’s going to be a lot tougher to do it now. But, you are also wiser and, come to think of it, perhaps not being so little isn’t the worst thing in the world. You can probably stand up to some of those troublesome foes, now! It’s time to show them who is boss with this Adult Papa Gnome costume. Stand guard over the tomatoes and tulips with this brightly colored outfit of polyester interlock knit and crushed velvet with faux leather accents. The blue tunic and brown elastic pants make for a comfortable base, complete with mushroom details on the tunic’s neckline. The sewn-on velvet vest gives great contrast and the look of serious business while the curved brown felt boot tops and red felt hat still leave you approachable. Don your plush beard to demonstrate your wisdom or, if you’d like, pick up some blue face paint for… reasons completely all your own! 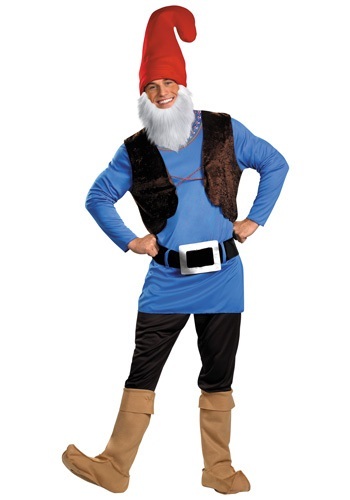 No one argues with Papa … Gnome!